Harps down, heads up! 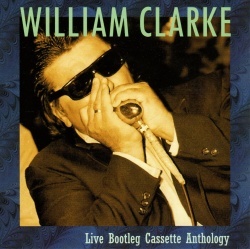 Harp Surgery has been chatting with the lovely Jeanette Lodovici, former wife of the late great William Clarke, about her latest CD release: William Clarke – Live Bootleg Cassette Anthology. Read on to find out how you can win a copy! Jeanette explained how the project came about: “There are so many pirate recordings out there of my late husband. Two of his fans sent me some of this bootleg music. Unfortunately it was poor quality, so I sent it to three different studios and finally we got a decent sound out of this badly recorded material.